Events and conferences offer a unique opportunity to get in front of your prospective customers, and have a one-on-one conversation with them. Businesses worldwide spend a staggering $500 billion on events each year (source), such is the importance they place on meeting with prospects face-to-face. With all the digital tools and communication available to us, face-time is increasingly rare. And valuable. Unfortunately much of that investment goes to waste, thanks to poor lead capture and follow-up practices. At every event we see rows of exhibitors relying on outdated processes for lead capture – such as collecting business cards in a fishbowl, or using paper forms filled with handwritten scribbles. And when it comes to the follow-up, it doesn’t get much better: a flurry of generic, impersonal emails that come through weeks after the event. At Akkroo, we believe there’s a better way to do event lead capture. 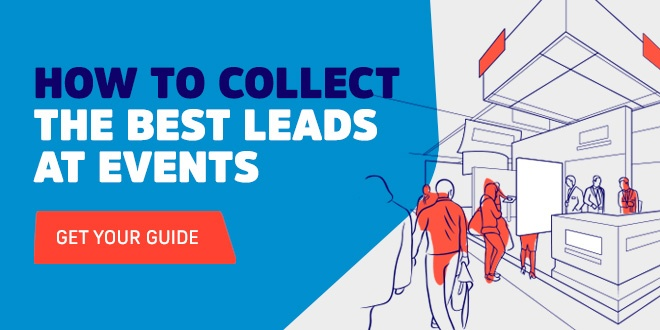 So we’re sharing five top tips for collecting leads at events. One of the most important things to remember when designing a lead capture process for your next event is that simpler is better. If you’re using a paper form for lead capture at events, the only way to make sure you get all the data you need is to have a long, cluttered form to cover every eventuality. Many form fields will be irrelevant to people you speak to, and reps will need to concentrate on filling out the form correctly, rather than speaking to the person in front of them. Instead, collecting leads digitally will let you tailor your forms behind-the-scenes, so different form fields show up depending on the answers you get from prospects. This makes the form as simple as possible for reps (or prospects themselves) to fill in, so they can concentrate on having a conversation rather than filling out paperwork. If you currently use badge scanners for lead capture, consider the data you got back after your last event. How many email addresses were missing, or had typos, or were generic Gmail or Hotmail addresses? At a recent event I spoke to an exhibitor who had a dummy email address he specifically used when visiting shows. This way he could register for a badge, safe in the knowledge that he wouldn’t get pestered by exhibitors he spoke to. And that was an exhibitor – someone at the show with the goal of capturing leads himself! When it comes to capturing leads at events and conferences, focusing on accuracy is essential – particularly when it comes to people’s contact data. Every hole in the data you collect represents a missed opportunity for your business, so when talking to prospects at events, take the time to get it right. Getting people’s names and email addresses right is important but if that’s all you collect at an event, you’re not getting a lead, you’re just getting a list of faceless contact data. The best event lead capture processes recognise that context is king, and that you need a way to capture all the extra information when you’re speaking with a prospect. What does their business do, what challenges are they facing, and what areas of your company’s offering are they particularly interested in? All of this extra information will help you make a personal connection with that lead, and can be used to tailor your follow-up communication with that person. One of the most common mistakes we see companies making is with their follow-up emails after the event. After every event we visit, we always receive a flurry of generic, impersonal emails that you know have been sent to a whole list of contacts. These are from a range of exhibitors, including global organisations with significant investment in CRM and marketing software. After all the money you’ve invested in attending and exhibiting at each event, surely it’s worth working to improve your follow-ups? Instead of sending out a generic email a week or so after the event, your team can use the additional context gathered during the lead capture process to personalise the follow-up, and send something that’s relevant to that person’s needs and what you discussed at your event booth. It’s time to change how we think about events. They aren’t something separate from your sales and marketing; they’re where all your hard work comes together and you have an opportunity to speak directly to good-fit prospects, face-to-face. Using an Event Lead Capture solution to collect leads at events makes it easy to join-up your events activities with your sales and marketing tech stack. For example, Akkroo’s Event Lead Capture solution integrates with CRM and Marketing Automation tools (including SalesForce, HubSpot, Marketo and more). With these integrations, plus the context you gather during the lead capture process, you can assign the correct person(s) in your team to follow-up with that lead. A joined-up Event Lead Capture process will help you feed Event Qualified Leads into your marketing and sales activities, instead of treating events as something separate and siloed from the rest of your business.